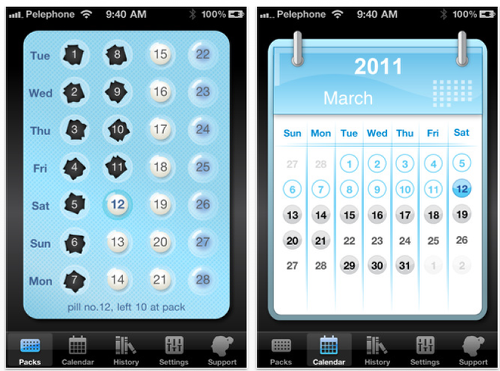 Hashsoft today is proud to announce the release of myPill – Birth Control Pill Reminder, for iOS. myPill is a useful tool that helps women who use birth control pills to remember to take a pill, predicting future periods, track history and more. "The idea for this app came from a real life need," said Tal Hashai, author of myPill. "I have several pill taking friends, which use their phone’s alarm to alert every day in a certain hour with concealed reminder message, having to disable it manually when the seven day of break start, redefining it on a new pack." We’ve seen pill reminder apps before. There are two things that distinguish this one from its competitors. It provides a verity of features that answers most women needs, it has friendly intuitive UI and high quality graphics that makes the whole usage experience fun. "When I wrote this app, my goal was to make the lives of women who are taking the pill easier. The design of this product is a result of conferring with different women, most of them had common needs while some had exceptions." said Tal. MewSim: iQuest is a romantic quest of a little errant for the love and happiness. It is a moving story of a young, fidgety cat and its adventure to honor the lady love. The hero will win the love rushing into dangerous adventures opposing the hordes of mice, gangs of Don Crowleone and facing its own fears and vices. MewSim: iQuest is an outstanding mix of humor, intense arcade action and puzzles. The game is free to play and all you need to enjoy it is an iPod Touch, iPhone or an iPad to run it in HD. The game is a spin-off from the ‘MewSim’ series and continues the story of the original ‘MewSim’ a pet-game about a kitten to care for and to bring it up either an obedient and affectionate or just a little evil. MewSim has won lots of fans since its launch being an instant hit of Russian Apple App Store reaching the top in both Games and Free sections there and being the 1st in both Family and Simulator games in Polish Apple App Store. Following the success of Burn the Rope, Big Blue Bubble is proud to announce their partnership with startup Krot and Enot and the arrival of their latest joint effort, Animal Pop! It’s a bubble popping bonanza where you pop bubbles to save pets! Pop two or more bubbles of the same color to float all of the pets to the top and win. Watch for power-ups to pop those bubbles before your time runs out! 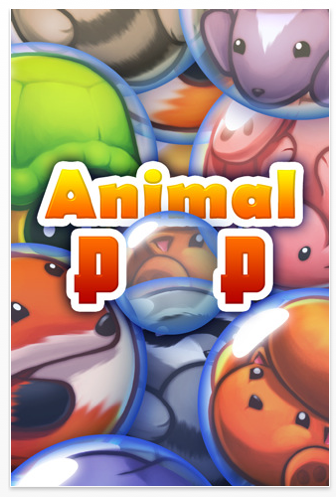 Super easy controls and fantastic art combined with addictive gameplay make Animal Pop easy for anyone to pick-up and play! Animal Pop is a blast! • Simple, pick-up and play controls! Enterprise developer iber4 today is pleased to announce the release and immediate availability of Eggs Shooter 1.2, an update its popular egg throwing game for iOS devices. 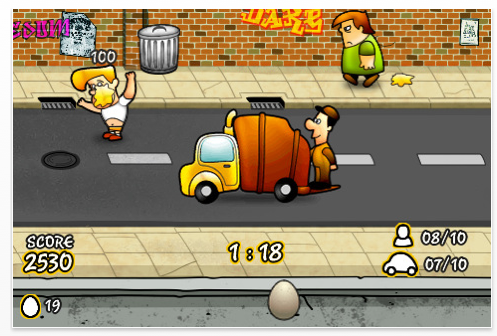 Eggs Shooter is played by throwing eggs to all moving "things" in the street, sliding an egg over the iPhone/iPod screen. You have to consider the wind, throw power and shooting direction to master this art. Eggs are limited so don’t go around wasting shots, unless you can find those eggs baskets that will help you replenish your stock. This game features many levels. Players must pass several levels to visit the streets of the neighborhood. The rapid movement of people and wind make successive levels more challenging. Bonuses are awarded for reaching a level shooting all money bags. Be Advised: This Game Can Be Addictive. Wordulator now has three ways to play. Players can choose to play Word Dash, Classic, or the new mode, Word Hunter. 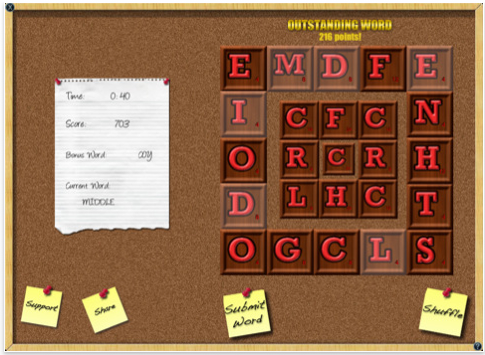 Word Dash gives the player 3 minutes to create as many words and rack up as many points as possible. The classic mode starts with 2 minutes and each word gives points and more time based on the value of the word. Word Hunter, the brand new mode in 2.0, gives the player 3 minutes to hunt for the words on the list. Each word gives the played another 30 seconds to find more words. Create words by simply tapping on the letter blocks. Blocks are arranged in layers. You can start on any layer, but once you go in a layer, you cannot go back out. However, the blocks do not have to be touching to create a word. The faster you create words, the higher your score will be. 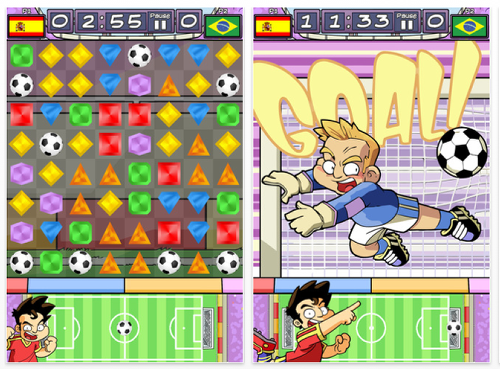 Atom Studios today is pleased to announce the release of World Stars Soccer Puzzle Edition 1.0, its new videogame for iPhone and iPod touch. World Soccer Stars is an addictive skill game where you can take the lead of nine of the best world national football teams. Based on a simple but complete gameplay, outcome of matches are decided by your talent and speed of decision over your opponent. Amazing dribblings, spectacular shootings, memorable highlights. Have you ever dreamed of lifting the world cup? In addition, humor is one of the keys to the game and by its original comic designs, you can’t help bursting out laughing when you play with any of the charismatic captain of each team. The game is perfectly suitable for all ages through its various levels of difficulty. If you think you have mastered it, try hard difficult settings and get ready for a real challenge. Swedish indie game Studio Spogg AB today is pleased to announce the release of Rainbow Rage 1.0, a fast paced highly addictive game for iPhone and iPod touch. In Rainbow Rage, the classic arcades meets the modern game arena. Graphics are inspired by the old retro games, but takes it to a whole new level with advanced particle systems, smooth animations and beautiful artwork. Defend your cities against a roaring meteorite storm, as you progress in levels the intensity rapidly increases. Every level is only 15 seconds long, which makes for incredibly fast and challenging gameplay. Tap on the display to place shots on the screen, but be careful not to let the energy meter run out! Collect shooting stars to activate a variety of power-ups, including getting your lost cities back or enabling the cities’ shields. 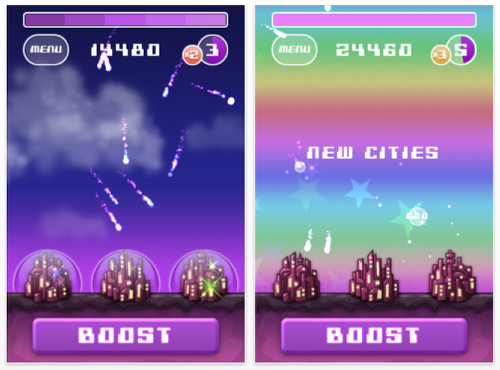 If many meteorites are popped in one shot, the rainbow rage mode starts, giving the player unlimited energy for a short period of time and adding a multiplier to the score. Riptide Games is thrilled to announce the worldwide availability of iLookGrownUp, the latest in their hit series of iLookApps. 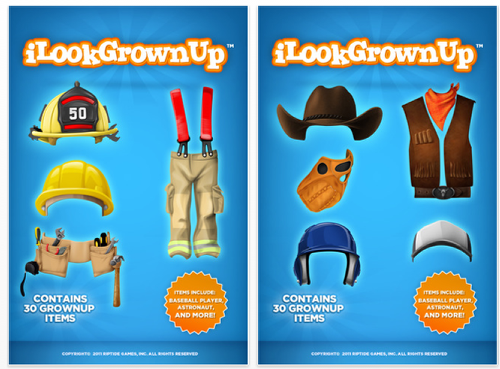 iLookGrownUp is the companion app to the previously released iPrincess, and has the same features that have become the hallmark of this series. Riptide Games also announced today that they recently surpassed 2.5 Million total downloads on the App Store. "We are amazed at the support the iOS community has given our titles." said Brian Robbins, Founder of Riptide Games. "The thought that our games and apps have been downloaded and enjoyed more than 2.5 Million times is absolutely incredible and we are so glad to help entertain so many people." 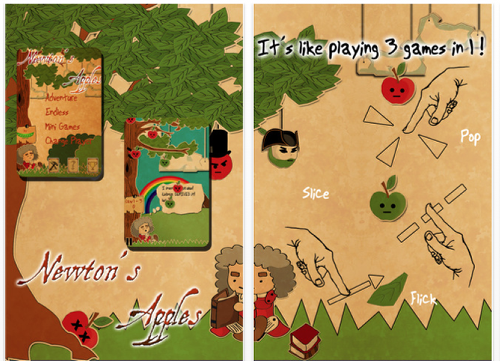 edenpod has announced NewtonApples 1.0 for iOS, their new arcade game where players save Sir Isaac Newton from getting hit by falling objects, and discover his three Laws of Motion at the same time. The goal is to pop falling red apples, slice falling green apples, and flick away descending green leaves, allowing Newton to remain asleep under the tree. Players score points by preventing Newton from being hit twice. 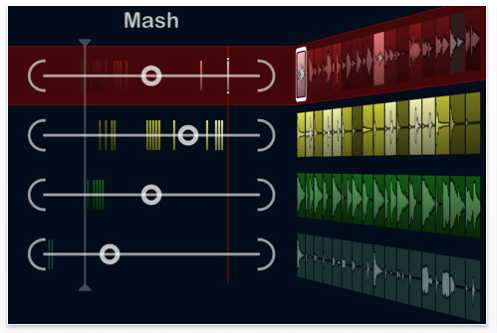 Steinberg Media Technologies has announced the successful recent release of LoopMash 1.0 for the iPhone and iPod touch. Representing a simplified user friendly version of the LoopMash virtual instrument, this musical utility combines a simple yet awe inspiring 3D user interface with vibrant graphics and intuitive music mixing controls to give users a mixing app that is as responsive as it is addicting and engaging to play with. The perfect mobile tool for music lovers and all app enthusiasts alike, LoopMash is currently available for download on the Apple App Store. This app isn’t simply a music manipulation tool. It’s an addicting genre-bender of a mobile experience that will have users creating their own music at home, on the way to work, out on the weekend, and at every step in between. Its innovative approach to mixing allows users to simultaneously merge up to four two-bar loops by matching and replacing the comparable elements in each individual song. Now, admittedly this sounds like something that the casual user might feel lost doing, but in practice LoopMash’s mixing controls ensure that the music creation process is both intuitive and seamless. DotTribes and The Green & Energy Consulting group has announced the first update of iEV, the world’s first electric car simulator. iEV brings Electric Vehicles (EV) closer to the people, showing that the perceived range problem is not an issue for most drivers. It also helps its users to save money when they have to choose which EV to buy. The results are specific to the driver’s personal behavior, geography, and the car itself. Users can set the car’s configuration from presets (Small or Medium sized car, SUV, etc. ), or they can configure the variables one by one, such as car weight, area, and aerodynamics. Users then need only to press start and begin driving. When they arrive at the destination, they press stop and the results are presented immediately to them. 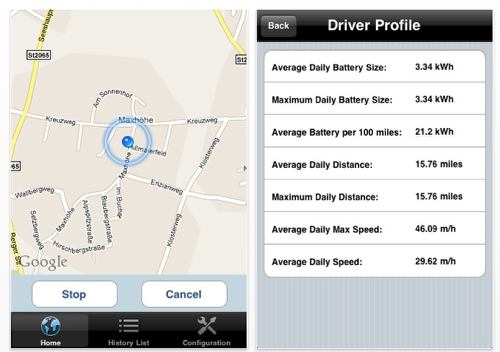 After several uses the app creates a driver’s profile, showing battery consumption and ranges in daily average and peaks. 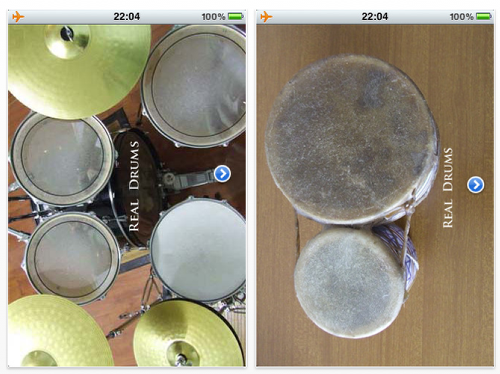 iPhoneXCoder has announced the release of Real Drums 3.0 for iPhone, iPad and iPod touch devices. Real Drums turns any iPhone or iPod touch into Professional Drums. Do you wish to surprise your friends and enjoy with them by playing drums and also other percussive instruments (as bongo)? "Real Drums" is the application for you. Sounds are taken from original instruments and they are real and nice! You can easily set instruments and sound kit (6 drumkit) from application menu. Real Drums is developed to give you the best sound performance and no latency, for the best experience. Download and Enjoy. 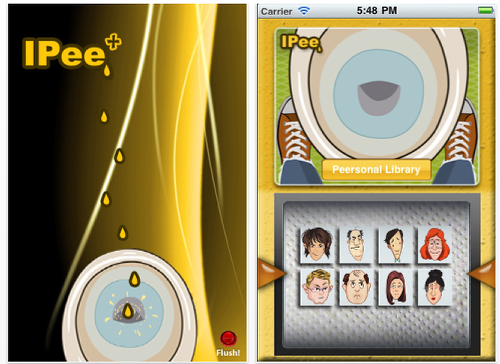 iPeeMobile has released iPee Plus 1.0, a entertaining iOS app. We’ve all been in situations where we’ve needed to relieve a little extra frustration. From the annoying boss in the office and the irritating teacher in the classroom, to the nerve-breaking referee in the football game and the cheating spouse. Luckily, with just release iPee Plus for iPhone and iPod touch all your problems can be instantly flushed down the drain with the push of a button. Deriving from old Far East traditions, iPee Plus is one of the funniest and shrewdest iPhone application ever offered to iPhone users around the globe. It is indeed a non-violent tool designed to calm down any kind of aggressive emotions. Based on an old tradition deriving from the Far East, where workers often punch images of their detested bosses drawn on punching bags during their lunch breaks. 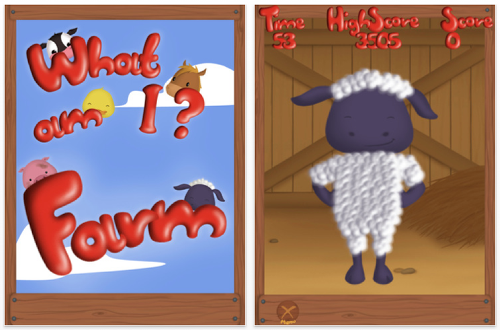 Developer Wonky Woo Games has just released to the App Store What Am I Farm 1.0 for the Apple iPhone, following on from the popular iPad version. Join us for lots of farm-ily fun. Building on the foundation of What am I…Pets the Farm edition features five farm animals in four different game modes. It’s simple, it’s cute, it’s entertaining, and more importantly, it’s educational and perfect for parents focused on gently introducing their children to farm animals through the world of technology. Word Magic Software today announces English-Only Thesaurus v.1.0 for iOS, an update to their world-renowned reference work, and the largest thesaurus of its kind. 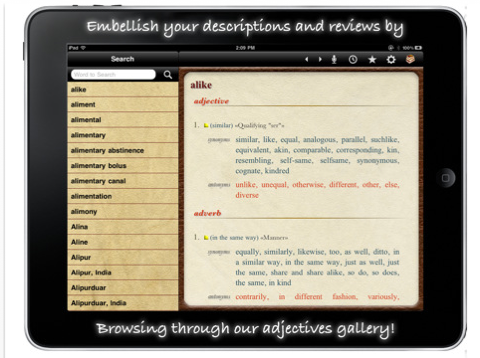 The app is an unparalleled compendium of several standard English dictionaries, idiom & colloquial dictionaries, and proverb dictionaries. Completely self-contained, an Internet connection is necessary only for audio playback of word and sentence pronunciation in English. Word Magic Software has specialized in natural language processing since 1989. Their English-Only Thesaurus contains more than 228,000 entries, 1,000,000 synonyms, and 280,000 antonyms. In addition, color pictures help define key nouns and adjectives. Both American and British English words are included, a feature unique to the app. The captions can be found in English and Spanish, depending on the device default language. 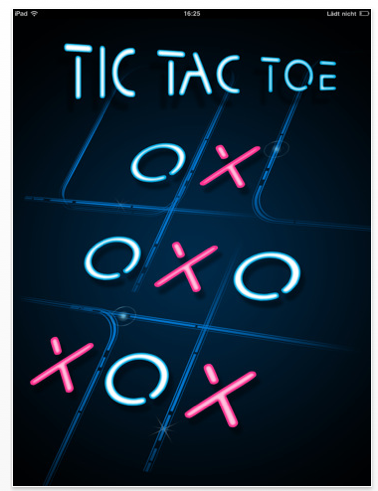 mobivention today is pleased to announces the release of Tic Tac Toe Glow 1.0 for all iOS devices. As the game has created a huge demand on the Android platform in the last weeks, it is now also available for iPhone, iPod and iPad in the Apple App Store. Tic Tac Toe – or naughts and crosses – is a well-known, popular game. The mobile version of this classic game is following the same concept: 2 players, 2 signs, one gameboard. Each of the players tries to place his/her symbol in a horizontal, vertical, or diagonal row. Whoever succeeds first in placing three symbols in a row is the winner. mobivention’s Tic Tac Toe is presented in a modern and appealing glow design which grants the players a special game experience. Additionally features like the player’s choice between Human and Artificial Intelligence with three difficulty levels, Facebook and Twitter integration as well a language support for 5 different languages are highly appreciated by the users. In these tough economic times of high and rising fuel prices drivers are turning to new innovative products to help them get the most value for money from their motoring. 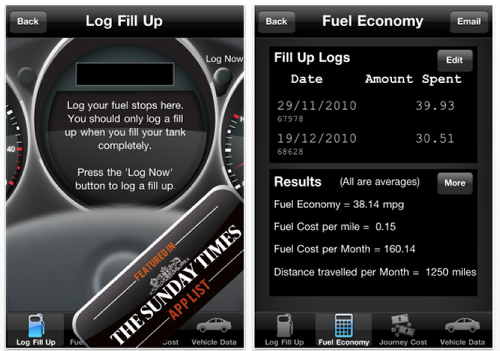 The ‘Fuel Economy Calculator’ iPhone App (featured in The Sunday Times App List in the UK) addresses an often overlooked part of budgeting for your car – checking how efficiently your vehicle uses the fuel you put in. Apple’s App Store finally has a great supercar app. 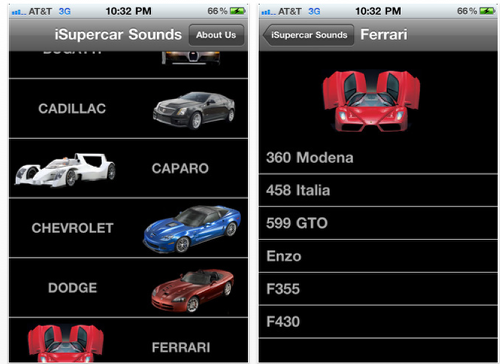 PS Professionals today introduces iSupercar Sounds 1.0 for iPhone, iPad and iPod touch. iSupercar Sounds is the best application in the App Store for auto enthusiasts. With the ability to play the sounds of your favorite Supercars, scroll through a high-res gallery for every car, and save your favorite photos as your wallpaper. iSupercar Sounds is a must have for every car nut! Over 30 minutes of 320kb/s engine sounds from your favorite cars! The paid version of the iSupercar Sounds app will be updated with new cars, wallpapers and sounds once a week. So remember to keep checking for the newest version. Over 40 cars. Almost 30 more coming with it’s first scheduled update. Cosmonaut Games, an exciting new mobile application developer focused on games, has today announced the successful recent release of NewPark Blockers HD for the iPhone, iPad, and iPod touch. This game app is a modern re-imagining of similar classic brick breaking arcade games from the past with a wide array of new twists and spins up its sleeves. Complete with vibrant graphics, exhilaratingly fast paced gameplay, and featuring seemingly endless levels, power-ups, and varied gameplay NewPark Blockers HD is the mobile block busting arcade experience legions of users will recognize and embrace. 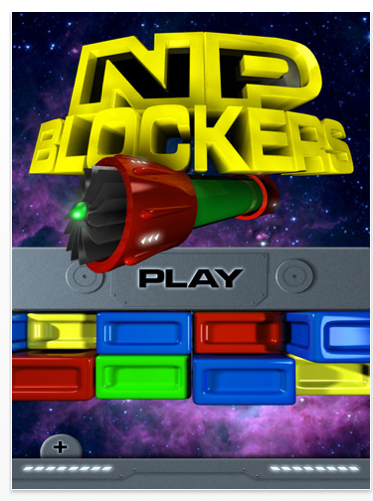 NewPark Blockers HD is currently available for download on the Apple App Store for only $0.99. This game was created specifically to offer users the highest caliber arcade gaming experience possible on their mobile devices while keeping the authentic feel of brick breaking games from the golden age of arcade games which it’s meant to pay homage to. NewPark Blockers HD is structured as a conventional game, including forty eight sequentially more complex and challenging levels for users to play through. The game itself charges players with controlling a moving platform moving left or right on a two dimensional plane at the bottom of the game screen, keeping a game ball bouncing up and down without falling off the screen. As the game ball flies up it will hit and break a variety of structures composed of separate blocks, with the players aim being to destroy all the blocks on every given level in order to move forward through the game. 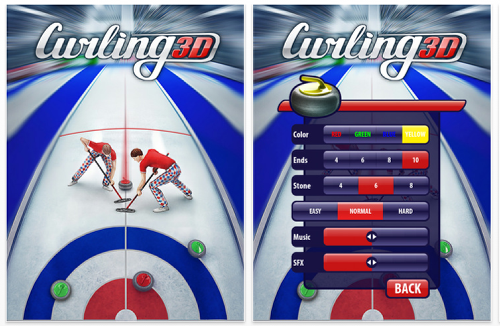 MaxNick today is pleased to introduce Curling3D 1.0 for iOS, their curling simulation game for one or two players. Similar to shuffleboard, the game is played on a flat ice curling sheet, roughly 15×150 feet. Players slide round stones of about 40 pounds towards bull’s eye targets at either end. Two teammates may use brooms to sweep the ice in front of the moving stone. Curling3D is a follow-up to MaxNick’s successful iCurling game, and adds a new dimension of realism with 3D rendering and on-screen players. Many user suggestions have been integrated into this new curling simulation. Curling 3D attempts to simulate the excitement of the game by incorporating many aspects of the actual sport. Fundamentally, curling is about force, mass, friction, momentum, rotation, and collision. The app exploits the sophisticated physics engine built into the iPhone OS to generate a convincing simulation of all these elements as they interact. In the terminology of curling, the weight is the velocity of the stone; the turn is the rotation of the stone (which affects its trajectory); and the line is the direction of the throw or delivery. Curling3D allows the player to continuously and independently control all three, permitting advanced tactics such as the guard, takeout, and tap. In addition, the app allows the player to sweep the ice while their stone is moving, adjusting trajectory after the delivery. 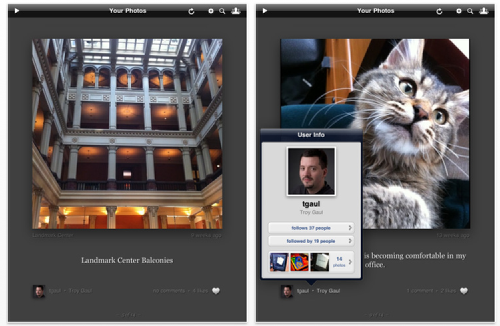 InfinitApps improves on the recent 1.0 release of Instagallery, which has quickly become a highly-ranked photography app for iPad. Instagallery is the first native app for iPad dedicated to viewing photos on the popular Instagram service (via their recently released API). The new 1.1 version adds a landscape view which is especially useful on iPad 2 when using a Smart Cover. 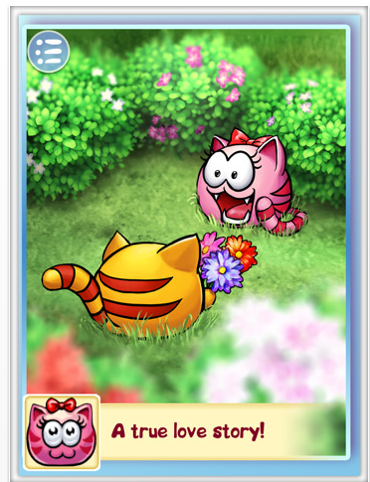 1.1 also provides a miniature version of its elegant gallery interface for iPhone and iPod touch users. Instagallery 1.1 also includes a more attractive icon, improves handling of users who have marked their photos as private, and fixes some small bugs. Rocket 5 Studios, an emerging independent game developer, announces the release of Alien Booth 1.0, their latest app for iOS. Alien Booth features the ability to easily transform pictures of friends, family, coworkers and even pets into amazing looking aliens. It is available on the iTunes App Store today for $0.99. 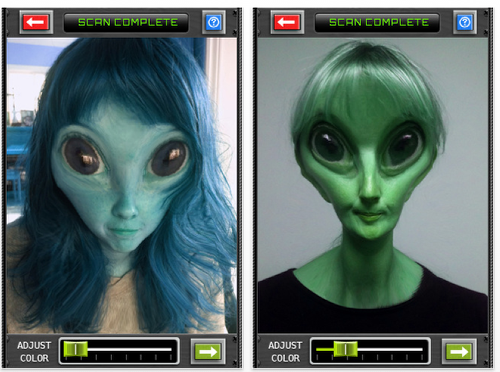 Using simple on-screen controls, create fun and realistic looking aliens from pictures taken with the iPhone camera or that are already stored in the iPhone, iPad or Touch photo library. Easily share aliens on Facebook, Twitter or email from within the app. Save aliens to the photo library and then send them via MMS. Shake the device to see before/after versions of the alien or toggle between before/after portrait and side-by-side views. Corporate Smalltalk Consulting, Ltd. today is pleased to announce Fax Reader 1.6.7 for iOS, an update to their document viewer/handler app that allows the user to view the TIF files generated by standard office fax machines. As faxes are increasingly emailed to save on paper costs, Fax Reader works by circumventing the existing document display logic found in iOS, which will display the first page of a fax but not allow access to subsequent pages. The app includes Dropbox connectivity, and functions as a document handler with "Open in…" functionality. Fax Reader enables viewing of multi-page faxes by first importing the entire file into its storage area. 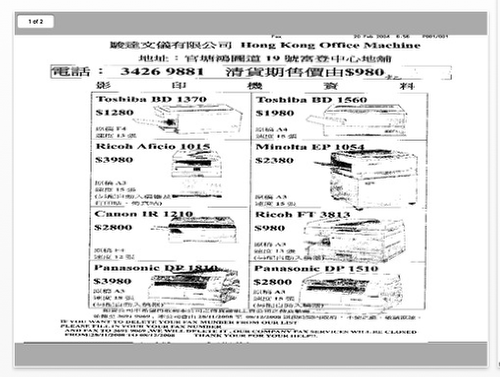 Once imported, the file undergoes one-time pre-rendering that ensures the fax is re-scaled to be optically correct and to provide the fastest possible rendering when viewing a multi-page document. The user can copy documents into Fax Reader by using iTunes to copy files into, delete, or copy them out of the app. Users can also ask Fax Reader to open documents from other apps, like Mail. Fax Reader does not need to be running to open documents from other apps. The app launches with the following file import locations displayed: Local Storage, Dropbox Storage, iOS Photo Library, iOS Clipboard. 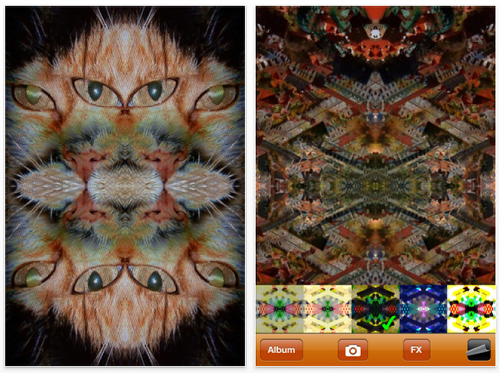 Interealtime Software today launched their latest innovation – VK: Video Kaleidoscope for iPhone and iPod. Using live video from the built-in camera and high-end realtime processing, the traditional kaleidoscope is taken into a whole new realm with this intuitive and highly polished app. Rather than just reflecting the image with a system of mirrors, VK uses complex visual effects to combine the mirrored images in new and totally unexpected ways. It really is instant entertainment, transforming everything around you immediately – the app processes live camera video at 30fps with no lag! It can create beautiful works of art with delicate patterns or nightclub VJ style visuals depending on the effect and how you use it. 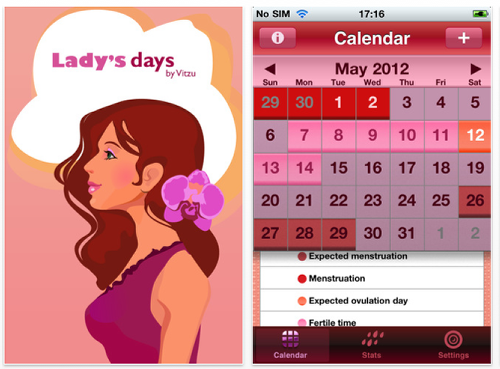 Vitzu today is pleased to announce Lady’s Days 1.0.3 for iOS, an update to their Health & Fitness app that displays a woman’s menstrual cycle on an easy to read graph or calendar. Whether seeking to become pregnant, avoid pregnancy, or simply monitor the health of their reproductive system, the app provides the user with 100% accuracy in predicting ovulation by combining two methods: basal body temperature readings and calendar days between periods. The app can also send push notification reminders immediately before the start of each cycle. Lady’s Days is simple to use once the woman’s personal information has been entered into the Settings: Length of Menstrual Cycle (21-35 days), and Length of Menstrual Period (2-7 days). The app operates in portrait mode and opens to display a five-week monthly calendar. The user may go backward or forward and select any day. Touching the "+" button in the upper right opens the data entry page for that day. There is a Yes/No button to answer the question, "First day of cycle?" The Basal Temperature button opens the Apple picker (odometer) display, and the user may dial in any temperature from 95.0 to 103.9 degrees Fahrenheit. If no temperature is entered the reading defaults to 97.9 degrees. Last, there is an empty text field for notes. iGotIt Games today announced Colorflys, their up and coming game for iPad. Colorflys is a pleasing casual game with a unique visual style and relaxing audio that blend to form a fun atmosphere to immerse players. 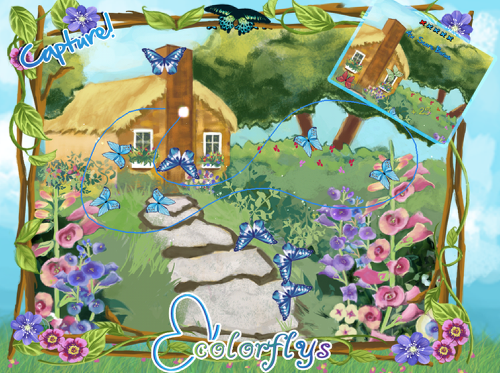 Players will swipe their finger around the screen capturing groups of butterflies of like colors. They’ll need to avoid obstacles getting in their path, like other colors, breeds or enemies as these will cause their capture to fail. Further along in the game they will need to create butterflies by color blending. "Beautiful and relaxing," says David McGraw, Developer. "This is more than just capturing butterflies. Players will need to think as they advance through the game. They’ll need to remember objectives in order to earn a higher score and they will need to know some color theory in order to properly create butterflies." 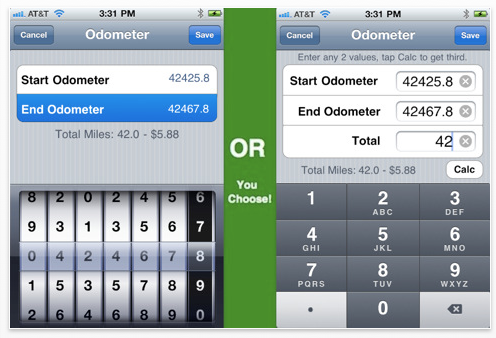 MileBug, the premier iPhone mileage log application, is now available for One-Third Off the regular price. Only $1.99 through April 15th as a special Tax-Time Sale. MileBug is one of the veteran App Store applications first available in August 2008, and can often be found in the Top 20 of the Finance category. From small to big business, from realtors to direct sales consultants, MileBug continues to serve those needing a mileage tax break. 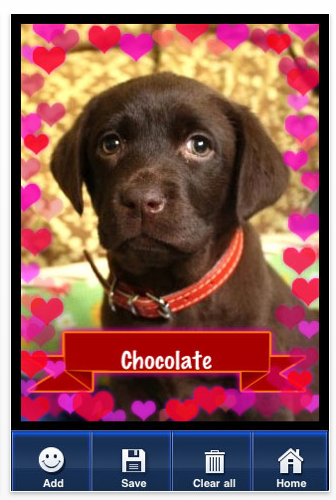 The iPhone developer Underplot Apps released its third app for photo decoration called Blood Booth. It follows the success of Doodle Booth and Pimpy – both of them were featured as New & Noteworthy and are downloaded from over 500,000 users worldwide. These three apps for photo booth are made in a stylish way and all stickers inside are original, realistically hand-drawn pictures. Also the apps are free for download and with option to extend with in-app purchases if you like! "When we saw how much people like it, we released a content update just 2 weeks after the initial release and right now there’s a second content update, so we hope everybody is as happy with the app as we are!" says the developer. Pimpy is maybe the largest app for adding stickers to your photos. There are more then 700 stickers grouped in over 20 categories like Hairs, Eyes, Hats, Glasses etc. and even Tattoos! Currently Pimpy is free for download and most of the content inside it is free.